An agency fund represents a true partnership in supporting local charities! We want to recognize a special partner today – charitable organizations with Agency Funds under management. We provide fiscal investment management to thirty-three (33) Agency Funds which includes lower investment costs and compliance for financial staff and auditors. 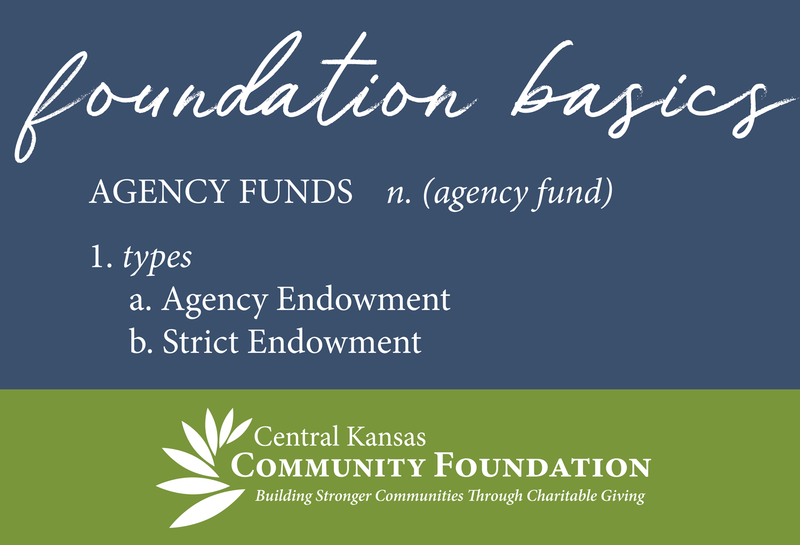 Agency Endowment: A not for profit organization provides revocable authorization to the Foundation to manage the money in its fund. The organization can request and receive the entirety of its assets back at with mutual approval between both boards of directors. The fund is recorded on your organization’s books as an asset and on the Foundation books as an asset and a liability. All contributions to these funds must come from your organization directly. We cannot accept charitable gifts from individual donors to Agency Endowment Funds. Strict Endowment: A not for profit organization irrevocably gifts the fund and all future earnings to the Foundation in perpetuity. An annual payout consistent with our spending policy is designated to the organization. This option is best for organizations that want to assure donors that the endowment’s principal will not be invaded, or those that want to honor a donor’s bequest of an endowment fund. The Foundation can accept charitable gifts from individual donors to this type of Agency Endowment Fund.